This glass diamond coaster is cut on a Morton Portable Glass Shop and then contour fused in a glass fusing kiln. The Morton Portable Glass Shop is designed to produce accurate repetitive cuts of different shapes such as strips, diamonds, squares, triangles, trapezoids, pentagons etc. It is ideally suited for stainled glass or fused glass projects and is available from Delphi Glass. 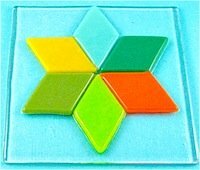 For this project twenty four colored diamonds were cut to make four coasters. Once the angles are set it is a simple process to cut the required diamonds from glass strips. The coaster bases were also cut on the Glass Shop. This coaster can be made from either COE 90 or COE 96 fusing glass. 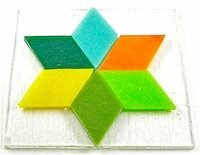 For the diamond coaster project you will need colored art glass strips and clear fusing glass. When the angles have been set on the Glass Shop it is a very simple process to then cut the glass diamonds. The diamonds were cut from art glass strips about 1 1/8" wide, there is no need to change any settings for different colored glass. Once the diamonds are cut, four inch square clear fusing glass is cut for the base and laid out as per the photo. The coaster can be fused on a kiln washed kiln shelf or on thinfire paper. If the kiln is large then all coasters may be fused at the same time. Place the kiln shelf in a glass fusing kiln and bring the kiln up to contour fusing temperature for the brand and COE of the glass being used. During fusing check the coaster to ensure that it is not overheating and beginning to fully fuse. Upon the diamonds and base glass edges have becoming nicely rounded, switch off fusing kiln before edges become distorted. When the glass has cooled to room temperature, remove glass coaster from fusing glass kiln.